Purchase a $5 Raffle Ticket and get a 2018 Blinkie Button free! Raffle Ticket Prize Winners Announced! Best of Parade Winner announced! The Pot O' Gold has been found! Congratulations to Leif Wooden and his family...Dad Toby, siblings Kale, Reid and Macy and friend Sam Pearson who found the Pot O Gold at the canoe access of the Pine River off County Road 37. At Andy's Bar, Ed will pour you a beer! Just look with your eyes, and you'll find the prize. Your clue is awaiting, now give us a rating. You can see water, are you a good spotter? Do you canoe? Then this is for you. A tube may float by, more likely in July. Set all the way down and don your crown! 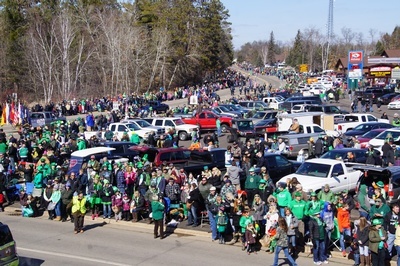 "Share Your Charm" at the 44th Annual St. Patrick's Day Parade and Celebration on Saturday, March 17, 2018! You don't have to be Irish to appreciate all the excitement associated with this decades-long tradition! Dust off the lawn chairs, get your Irish face on and load up the whole family as this 44 year celebration insures fun for all ages! Gather your family and friends and search for the Pot 'O Gold beginning Thursday, March 15. Register for The 5th Annual Clover Dash 5K which takes place on Saturday, March 17. 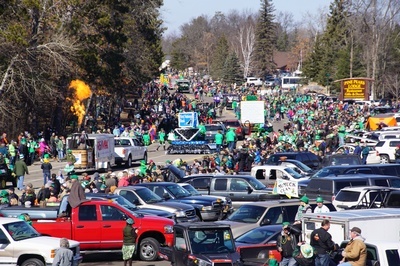 The race begins and ends in Crosslake's Town Square, so after the race you're in the perfect spot for pre-parade entertainment and more! Purchase a $5 Raffle Ticket and get a free Blinkie Button!  Raffle Tickets/Blinkies are available at Crosslake Chamber member businesses. Get Blinkie Button deals (Fri. & Sat. March 16-17), and join us the following weekend (Friday, March 23) at Andy's Bar & Grill for the Raffle Ticket Drawing Party! Your ticket could win you one of many terrific prize packages including two chances to win a weeks stay at Bay View Lodge! Raffle ticket holders need not be present to win, but we'll have great door prizes for lucky attendees too! Click Here for a listing of raffle prizes. The first of three daily clues released daily at 9 a.m. to guide you to the hidden Pot O' Gold. Find it and cash in on a prize package of goods and services valued at more than $1,000 courtesy of these Chamber member businesses: 14 Lakes Craft Brewing, Andy's Bar & Grill, Barstock Liquors, The Bourbon Room, Brenny Funeral Chapel, The Cedar Chest, Common Goods, The Crossfire, Crosslake Ace Hardware, Appliance & Laundromat, Crosslake Chamber of Commerce, Crosslake Bikes, Crosslake Coffee, Crosslake Drug, Crosslake Veterinary Hospital, D&D Beer Co. - Coors Light, Holiday Station Store, Judy's House of Gifts, Kick's on Route 66, Lake Country Crafts & Cones, Lakes Proud, Lakes Area Gallery & Frame Shoppe, Lundrigan's, Manhattan's, Maucieri's Italian Bistro, Mission Tavern, Nordic Haus, Northern Lakes Embroidery/NMN Inc., Moonlite Bay Family Restaurant & Bar, Northland Press, Passages of Time, Secure Wealth Group, R&J Broadcasting, Reeds Country Market, Studio Posh, The Wharf and Whitefish Lodge & Suites. Please drop off all your float riders/walkers in the Town Square parade lineup area. One vehicle driver can then proceed to The Log Church to take the shuttle back to meet your group. Chamber Bucks awarded to top 3 for-business entriesand top 1 non-profit organization entry. Hubbard Broadcasting/WJJY will award Chanhassen Dinner Theater Tickets to the most enthusiastic entry! Parade judges are located in the Better Living Concepts Sunhome at the Exchange Lot , midtown on County Road 66. Show 'em what you've got!